First let me say that in another of many days I’ve spent enjoying the wonders of the Montreal International Jazz Festival in the decade I’ve been attending this event the star of the show on this, the 5th day of this 10 day event was the inventive and forward thinking guitarist and composer Kurt Rosenwinkel. In world football they name the “Man of the Match” so on this day I’ll give my “MVP” or “Most Valuable Player” award to Kurt and tell you later of the wonders of his tremendously well-received appearance at The Theatre Jean-Duceppe, one of the beautiful indoor venues of the Place des Artes in the Montreal city center where the festival happens. This is saying something as each day is filled with a variety of engaging performances, indoors and out of doors, from Noon to well past midnight. I found it impossible to attend more of the festival this year and had already missed Charles Lloyd playing his three “invitation series” concerts and receiving the prestigious “Miles Davis Award,” Greg Osby with Terri Lyne Carrington in a salute to Dexter Gordon, the gala 80th birthday celebration for Wayne Shorter, Jason Moran’s inventive celebration of Fats Waller with a modern twist, and performances by an array of all star names including Wynton Marsalis, Larry Goldings, Courtney Pine, Bill Frisell, Joshua Redman, Jacky Terrasson, David Murray, The Bad Plus, Barry Harris, Chucho Valdes and many more. I read an article in the Montreal Gazette by a local writer who lamented that jazz must be dead because the festival had turned it’s back on jazz and was programming too much non-jazz. There is certainly all kinds of music in the lineup, including purely pop music to give the non-jazz fan more reason to come sample “The Real Thing” and become a jazz fan, but I don’t know what list of shows he was looking at, or, better said, what list he WASN’T looking at. There was jazz of every kind and from most any region of the planet to enjoy. My first day included time spent browsing the free outdoor venues and taking in some of that aforementioned variety as I saw a great sax-guitar led quartet from Quebec called The Simon Legault Quartet that had the locals going wild with their tasty offerings. I wandered over to one of the most popular outdoor venues, the blues stage called Scene Loto-Quebec where a trio of two dudes and a bass-playing chick from Ontario were rocking the blues for a huge, howling throng of blues fans. Then I made my way toward the Kurt Rosenwinkel show but stopped along the way to hear a fantastic singer-guitarist from Cape Verde named Carmen Souza who channeled her inner Billie Holiday, as if Billie were from Africa, then showed off her love of jazz in general, African music specifically and funk as well, doing a cool, funky version of Charlie Parker’s “Donna Lee.” I could have stayed there or outside at various venues all night probably and been very happy, but I was dedicated to seeing Kurt Rosenwinkel’s new Quartet and I was off to Theatre Jean-Duceppe. An associate of mine had told me some weeks ago when Kurt and this band, which includes pianist Aaron Parks, drummer Kendrick Scott and bassist Ugonna Okegwo, were playing New York’s famed Village Vanguard that I just HAD to go see this band. Unfortunately if was one of those delicious dilemmas, much like every day at the Montreal Jazz Festival, and I was not able to be in more than one place at once during that time. When I saw that the band was on the Montreal schedule I was pleased to be able to be there. The set was filled with music from the newest release Star of Jupiter, and as the name might suggest much of the music is other-worldly and sometimes dreamy in nature. I find the gentle spirit of Aaron Parks to be perfect for this setting. I’d seen him last year in Montreal with Joshua Redman when Josh had turned off the electricity and softened his sound for that project. There were passages of pure swing and occasional modern jazz electric groove that reached high energy level. 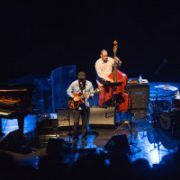 The outstanding elements to me were the new language in these compositions and the sounds created by Kurt Rosenwinkel. He played the occasional clean line on the big hollow-body guitar he plays but exhibited an ever-changing sound palette by pressing the pedals at his feet to add a chorus effect, some synthesized sound and even adding his own, live wordless vocal to the mix to create a truly human though out of this world texture too. Did I say visionary? This is music that is not quite like anything I’ve heard though the quartet set up and the flow of the music as well as the anthem and hymn spirit of the compositions reminded me a bit of the first Pat Metheny Group with Lyle Mays, Mark Egan and Danny Gottlieb. Until I talk Pat into getting that group together for at least a one-off quickie tour (Pat, are you listening?) I’ll take the new Kurt Rosenwinkel Quartet and enjoy anything and everything they have to offer. The screaming crowd inside the Theatre Jean-Duceppe felt the same and showed its feelings with three standing ovations, demanding encores! A great way to start my 2013 Montreal Jazz Festival experience…seeing the MVP of day 5!